With the Akiles DuoMac C31 you can bind documents with both Plastic Combs and 3:1 Pitch Twin Loop Wire. The DuoMac C31 is the only combination machine of its kind. The unique design of the C31 includes a wire closer (for use with 3:1 pitch wire), a plastic comb opener and the ability to punch both a 19 hole pattern for plastic comb binding and a 32 hole 3:1 pitch hole pattern for Twin Loop Wire Binding. Normally, you would have to use two different binding machines to do the same tasks as the DuoMac C31 allowing you to save space, time and money. Welcome to MyBinding video. 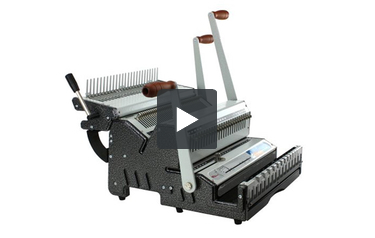 Let's have a look at the Akiles DuoMac C31, a 3:1 pitch wire and plastic comb binding system. One heavy duty system for both binding styles. 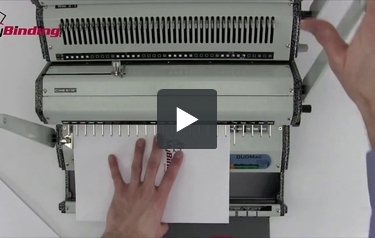 This video demonstrates 3:1 pitch wire binding on the C31. The first step is to set the side margin control knob so that all your punches are consistent throughout your entire project and your many projects. At this point you should remove any disengageable die pins you may need so there are no half holes. And according to the size book you're making and size spine you're using, you may want to adjust the depth of punch control knob as well. With all your settings in place, let's begin. Start with the covers and make your punches. And then continue on through all the pages in your project. The C31 can handle up to 20 sheets of 20lb paper per punch. With your project punched and ready to go, gather your sheets together and put them in order; it is time to bind. Select the right size wire spine you need and drape it over the holding fence on the front of the C31. To assist you in finding the right size spine for your project, simply place your completed project into these slots here and it will tell you what size spine would be best. A clever trick in wire binding is to take the back page and bring it around so that it faces the front. That way in the end, the seam of the spine is hidden by the back page and the back cover. Drape your project over the teeth of the spine and lift to remove the project from the fence. Then, with the ?C" of the bind, face it down into the closing unit. First, make a selection on the right hand side with a little dial so that the closer has a stop based on the size spine you're using. When that's all set, bring down the lever on the left hand side and close it all the way until the stop plays into effect. You're finished, the book is done, the seam is on the inside of the back cover, and you have a great looking book. That's wire binding on the Akiles DuoMac C31. For more demos, reviews, and how tos on this product and many more, check out MyBinding.com. Welcome to MyBinding video. Today we look at the DuoMac C31, a plastic comb and 3:1 wire binding machine by Akiles, one heavy duty system for both binding styles. 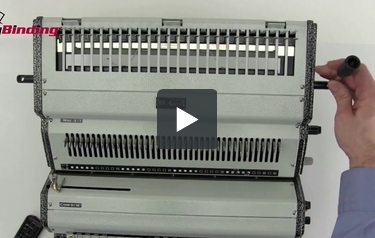 This video demonstrates plastic comb binding on the C31. First step is to set your side margin control so that all punches are consistent throughout your entire project and all projects. The C31 also allows you to disengage any die pins you might need so there are no half punches. This way you can make your settings, set them, forget them, and run your entire project. Depending upon the thickness of your book or the size comb you're using, you may want to adjust the depth of punch control knob. This allows for thinner or thicker margins. When your scrap paper comes out the way you want it, begin with the covers, punching all the way through. And then on with the rest of the insides of your book, easily punching up to 20 sheets of 20lb paper per lift. With all your punches made, gather your book together, it's time to bind. Select the right size comb and load it onto the comb opener. In comb binding, always make sure the plastic teeth of the comb face up and the project faces down. That way it doesn't fall apart in use. With the comb opener lever on the left or the right hand side, open the teeth of the comb and thread your project over them. You can do this all at once with one book or in smaller batches for larger books. Make sure the teeth go all the way through all of the holes. It's that simple with the Akiles DuoMac C31. For more demos, reviews, and how tos on this product and many more, check out MyBinding.com. Welcome to MyBinding's How To videos. This is easy assembly of the DuoMac C31. You've managed to get it out of the box, now you need to put it all together. Let's begin at the top and fasten the comb opener. You have two black rainbow-shaped brackets. Take the one with the "L" and place it on the left-hand side with the "L" facing in and screw it in with the Allen wrench. Do the same thing on the right side with the right bracket. Now take the entire assembly and set it atop the black brackets with the fence on the back side and again with the Allen wrench, fasten the bolts. The black handle with the metal shaft goes in either side, right or left, for right- or left-handed. Screw it right in; that's your lever to open and close the comb opener. Of the three levers provided, take one of the smaller ones and place it on the back post of the main unit. Twist it in with your hand and then with a quarter or a screwdriver, all the way in. Then, take the longest handle and place it on the more forward one. On the left-hand side, take the third and short handle and place it there. The two levers on the right are for punching holes, the one on the left is the wire closer. And that's it, that's how to assemble your C31. Happy binding! For more demos, reviews, and how tos on this product and many more, check out MyBinding.com. If you want a machine that will allow you to bind your documents with both plastic combs and 3.1 pitch wire spines, you need to check out the Akiles DuoMac C31. This is a great product that combines both document finishing methods in one convenient device. Let's take a look at its strengths and weaknesses so you can decide if this is the machine for you. The DuoMac C31 has a 20-sheet punching capacity which is one of the better ones found in a combination binding machine. You may be even able to punch more than 20 pages if you use a thinner stock than 20 lb. bond. This machine has an open throat and completely disengageable dies so you'll be able to work with a lot of different sizes of documents. You can even punch and bind legal-sized documents (8.5" x 14") if you want. The DuoMac C31 has an adjustable depth of punch margin control. This feature allows you to control where exactly the holes will be punched in your paper. You can place them far away from or as close to the edge of the paper as you want so you'll wind up with a document containing tear-resistant pages. Also, this machine has a side margin control so every page will be punched evenly. As mentioned above, the DuoMac C31 is compatible with two different binding elements: plastic combs and 3:1 pitch wires. This device has both a wire closer and a comb opener/closer so you'll have the ability to choose between these two popular binding methods. (Both of these elements have their own designated handles.) Having a machine capable of doing these two types of binding will save you money as well as space. Whether you choose to work with combs or wires, you can use the machine's diameter selector to choose the right comb or spine for your document. The binding capacity of this device depends on what method you choose. The DuoMac C31 is compatible with all sizes of plastic combs and wire spines up to 1-1/4" in diameter. Thus, your documents can contain as many as 425 sheets (combs) or 250 (wires). The DuoMac C31 has a wire holder to assist you during the binding process. Also, the wire closer has a continuous adjusting scale. This feature will allow you to close your spines properly every time you use the machine. This device comes with a one-year warranty so your investment will be protected. The DuoMac C31 is only compatible with 3:1 pitch wire spines. It cannot work with 2:1 binding elements. However, there are other DuoMac models that can, such as the C21 which can also handle plastic combs. The punching capacity is pretty good, but it's not really large enough for high-volume applications. This is a rather large device and the handles are a bit unwieldy. You'll need to make sure to make a lot of room for it, as well as be careful when moving it. Finally, this is a fairly advanced device so new users might have some difficulty operating it. Overall, the strengths of the Akiles DuoMac C31 far outweigh its weaknesses. It's terrific that this device allows you to bind your documents in two ways and that is has advanced features such as the adjustable depth of punch margin control. So long as you're not planning on using this machine for high-volume use, you'll find that this a terrific binding device that will make your documents look great.